We Began Invite-Welcome-Connect weeks ago! On Saturday, October 20, 2018, twenty-four SsAM members joined over three hundred Episcopalians from all thirty-four parishes in the Diocese of Delaware to attend a day-long workshop on the subject of Evangelism. It was a wonderful day as Mary Parmer, the creator of this innovative approach, shared how parishes can live into relational evangelism. I was so overjoyed by the number of SsAM folks who attended and the energy that the day produced that I changed our Advent adult formation program to focus on Invite-Welcome-Connect. When I mention the word evangelism, I bet that the first image that comes to mind is of someone knocking at your door wanting to share with you their relationship with Jesus Christ. These conversations often end with the person at your door wanting you to make a decision to follow Jesus Christ as your personal Lord and Savior. Sadly this is the idea that many of us have when we hear about being an evangelist. After Saturday, I believe I have a better understanding about what evangelism is about. First, it is not a program with lots of tasks, but rather a way of life. We live in a world and a society where people are hurting physically, emotionally, and spiritually. Every day we are overwhelmed with news stories and images that break our hearts. We are not taking care of one another. We are not taking care of the creation for which we have been called to be trustees. We are not considering those who will follow us. In this context people are coming to our churches looking for understanding and meaning for their lives. They are coming to hear a word about hope and love. 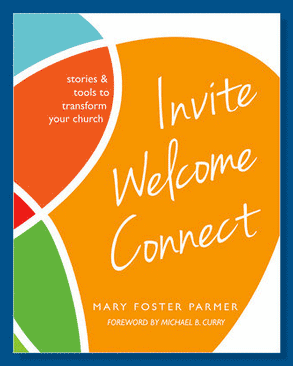 I see Invite-Welcome-Connect as a way for us as a parish and as parishioners and rector to embody what it looks like to be disciples of Jesus Christ. We are a people and a parish that loves God, loves Jesus Christ and loves the parish we attend. We want to invite-welcome-connect with other people who are looking for a parish where they will find meaning in the midst of all that is happening in their lives. We have a lot going for us and God has blessed each one of us with abilities and experience that we bring to our love of SsAM. I invite you to come to an Advent study that will dive deeper into what it means to Invite-Welcome-Connect. I am ordering forty copies of Mary Parmer’s book for the study that will begin on Thursday, November 29th at 5:30 p.m. Advent is a time when we prepare our selves to welcome Christ into our lives and I see Invite-Welcome-Connect to be in alignment with the themes of Advent. You can learn more about Mary Parmer and her work by visiting the I-W-C website. Click here to visit the Invite Welcome Connect website. Our Advent Study 2018 will focus on Invite Welcome Connect. Thursday Evenings, 5:30 to 7:00 p.m.
Click here to learn more about our Advent Study of Invite-Welcome-Connect. Click here to see all the posts on this website about Invite-Welcome-Connect.